If you are one of the increasing number of players practicing the overblow technique popularised by such players as Howard Levy, you will probably want to try a Golden Melody. It has larger sound holes and "long slot" reeds, which make overblows easier. Another feature of the Golden Melody is it's tuning, which is equal temparament, which optimises the playing of single notes and melodies. The Golden Melody has a classic retro style, the cover plates are rounded at the ends and flush with the red plastic comb, which makes it confortable in the hand. The Golden Melody comes in a tough red plastic box. If you are used to playing a standard diatonic harmonica this harmonica will make a cool and slighly unusual addition tro your harp collection. You can play more classic style on this harp as well as the Chicago blues style. Want to try something a bit different but easy to get to grips with? Now's your chance. 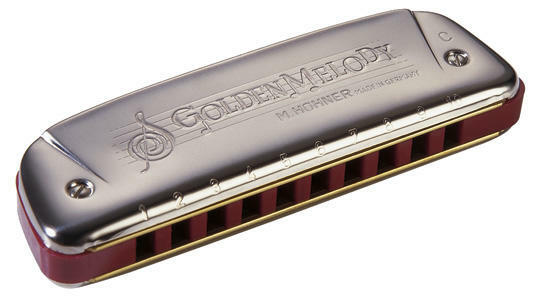 Check out the demonstartion video to see how versatile the Hohner Golden Melody harmonica really is.